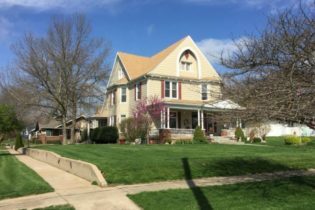 This classic home set on a corner lot on Clarinda’s west boulevard, 3-4 bedroom plus 2 1/2 baths on the main part of the home open to new large remodeled kitchen, large patio. The home has the traditional formal dining and living room, oak open staircase. But for what tops it off for B&B is a mother-in-laws suite above the garage with private stairway bedroom and full bath. This home has gone through two major remodeling over the last number of year. Street appeal with landscaped lawn.